I am way behind here on posting for these last couple of weeks, so I’m going to try to catch up here. Week 5 — No Non-fat, Low fat or Light (lite) Foods. We succeeded quite well. The only transgression was that our youngest ate the one individual serving of plain, nonfat Greek yogurt we had in the fridge for a snack. We won’t mention the “light” tea Hubby had the day after that week ended. 🙂 I have posted a recipe for ice cream made with an ice cream maker. I had hoped to make some cheese and or yogurt, but life beyond the blog got too busy. I will let you know as soon as I do though. Week 6 — Try 2 New Whole Foods. I actually switched weeks 5 & 6, knowing we would be out of town at a family reunion at which I would have little say in what we ate. I figured we could get those 2 new foods in early in the week before we left. Well, we succeeded, though it wasn’t quite as easy as I thought. For years, I have had the habit of bringing home a new food for the family to try. So, Hubby went to Jungle Jim’s to find some new foods in their one acre produce department. Surely there would be plenty of options. As it turns out, the options for in season produce that we had not tried before was limited. We ended up with canary melon and casaba melon. The canary melon was, you guessed it, bright yellow on the outside and a lighter yellow inside. It tasted very much like slightly salty cantaloupe. Worth having again, though I do prefer other melons. The casaba melon was yellow tinged with green on the outside and light green on the inside, like the inside of a cucumber. It also smelled very much like a cucumber with that same coolness. The flavor was I guess you would say mild (very little flavor). It won’t be a highly requested item at our house. Early this week we had fresh figs, which is also new to us, believe it or not. We sliced them in half topped with mascarpone and a little drizzle of honey. My picky eater loved them, as did Hubby and I. My good eater wasn’t impressed. I look forward to some more new foods we haven’t tried yet, like dragon fruit, when it is in season. 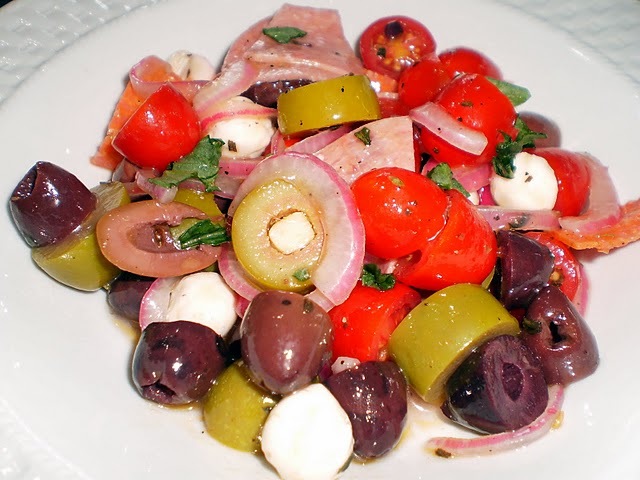 I posted a recipe for a yummy salad (Mediterranean?) that we really like for a cool summer lunch or dinner. Week 7 — Only 100% Whole Grains. This seemed like it would be easy because we buy 100% whole grains almost entirely for home. We found out though, it is nearly impossible to get a meal at most restaurants and get 100% whole grains. Think croutons on salad, bread on a sandwich, crust on a pizza or breading on fried okra (we stopped at Cracker Barrel on our way home from the reunion to load up on veggies, mmmm). Even things called “whole grain” are likely not 100% whole grain. 100 Days of Real Food has a good guide to Understanding Grains. This week’s challenge pretty much kept us out of restaurants (I think that’s part of the point though, huh? ), though the couple of times we did eat out, we realized our transgression during the meal. I have posted a recipe for 100% whole grain carrot cake muffins, made with no non- or low fat ingredients and with maple syrup instead of sugar. Oh so delicious! I also made some granola bars to take on the trip that turned out pretty well. It is a modification of the 100 Days of Real Food granola. We used steel cut oats, lots of seeds, a few raisins and no nuts. My family is thankful that popcorn is whole grain! I will be making my own 100% whole grain bread soon too. I had hoped to do that this week, but again, life and all… I’ll be trying pita and ciabatta as well as corn, I believe. I’ll let you know how that turns out. With this week coming to a close, we end the challenges based around the major food groups. The remaining challenges are about fats, sweeteners, habits and packaged foods. If you have been joining us in any of these challenges, I’d love to hear how it’s been going for you. Do you have any tips to make these challenges an everyday thing? This entry was posted in Challenges by hshaut. Bookmark the permalink.